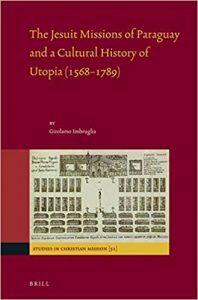 Girolamo Imbruglia has published The Jesuit Missions of Paraguay and a Cultural History of Utopia (1568-1789). The new books “explores the religious foundations of the Jesuit missions in Paraguay, and the discussion of the missionary experience in the public opinion of early modern Europe, from Montaigne to Diderot,” according to Brill Publishers. A table of contents appears below. More information is available at: https://brill.com/abstract/title/17430.